Thick cut baconSlow smoked and hand-trimmedMade with the finest cuts of porkEnjoy the perfect slice of bacon, every timeOscar Mayer Bacon Thick Cut.U.S. Inspected and Passed by Department of Agriculture.Naturally hardwood smoked.America's favorite Bacon.Net Wt 16 oz (1 lb). 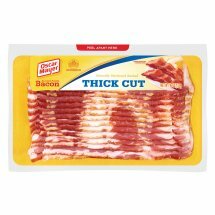 Oscar Mayer Bacon Thick Cut. Net Wt 16 oz (1 lb). Cured with Water, Salt, Sugar, Sodium Phosphates, Sodium Ascorbate, Sodium Nitrate.